Replacement muffler/resonator is both in one. That is the way it was designed from Chrysler. You have and you only need one. For your Chrysler or Plymouth Prowler (1997-2002). 2.25" inlet and outlet. Direct factory replacement for exact fit. 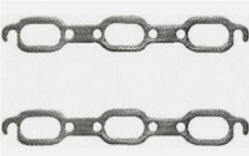 A high quality, direct fit exhaust manifold gasket set. Set of 2 one for right side one for left side. 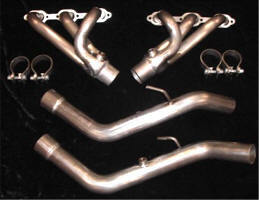 Performance Headers and Lead Pipes with performance Catalytic Converters. Designed specifically for the Prowler these performance Headers will give your Prowler a boost of new energy. All heavy gage stainless steel throughout - will never rust. No cutting - 1.625 inch primary tubes, 2.50 inch slip-fit collectors, Hi-flow Metal Matrix converters, 2.25 inch off road lead pipes. This system replaces your catalytic convertors with high flow performance Cats. Includes all hangers and mounting hardware. Does not include optional gasket. See this page for part. 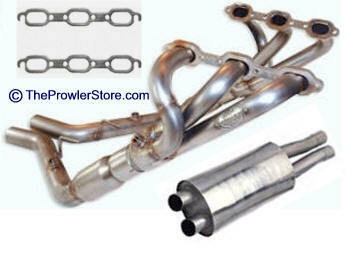 These headers bolt right up to your Prowler stock exhaust or to the Performance Exhaust that we sell. NOTE: For 1997 Prowlers you need to cut about 2" off the pipe going into the muffler and weld connect. You may use your factory O-2 sensors on these headers. ► Double your Horsepower gain! 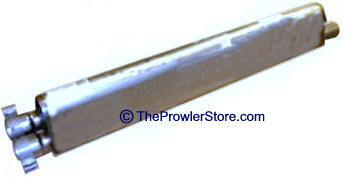 Add the PMC Upgrade Tune-up (see our store directory) to your Prowler with these headers. Give your HP a Kick in the back side! 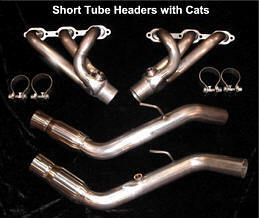 Performance Headers and Lead Pipes without Catalytic Converters. 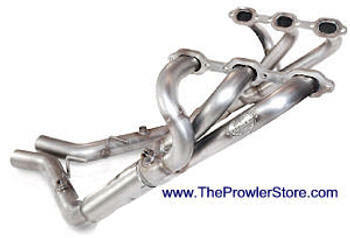 Designed specifically for the Prowler these performance Headers will give your Prowler a boost of new energy. All heavy gage stainless steel throughout - will never rust. 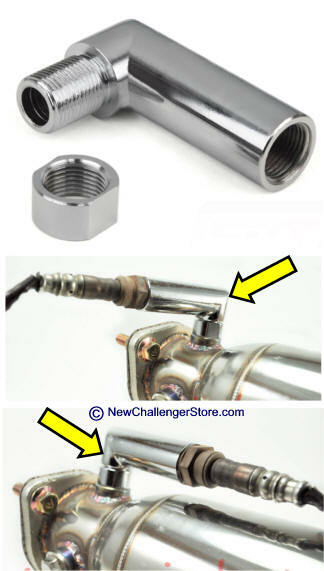 No cutting - 1.625 inch primary tubes, 2.50 inch slip-fit collectors, 2.25 inch off road lead pipes. This system replaces your catalytic convertors with high flow performance Cats. For 1997 Prowlers you need to cut about 2" off the pipe going into the muffler and weld connect. You will need to install O-2 Sensor Simulators. See this top page for product. Engineered specifically for Prowler, this 2¼" Cat-Back Exhaust System bolts up directly to your stock system, It emits a rich, snarling rumble sound befitting a prowling cat. 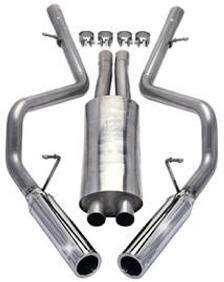 System includes High Flow Muffler and exclusive polished stainless tips and all necessary mounting hardware. 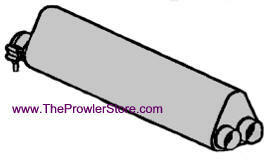 (see our store directory) to your Prowler with these headers. 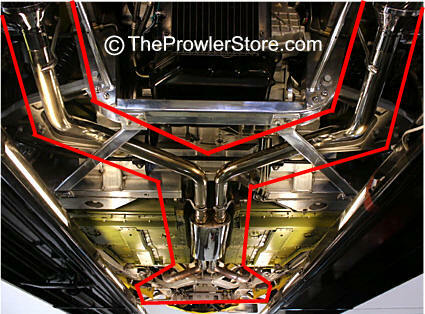 Cat-Back Exhaust System, 1999-2002 Prowler 3.5l. V6 FWD, Non-Turbo, -2 dr. dual polished, Driver Side Outlet, Polished tips. Gives it that Race Car RUMBLE! 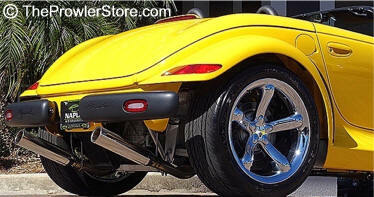 Plymouth Prowler 1999-2002 Performance Stainless Steel COMPLETE Exhaust System with High Flow Cat's and Muffler and polished tips. Biggest Performance Gain! Adds a Great Low Rumble to your Kat! Complete Performance Exhaust System from engine to exhaust tips. 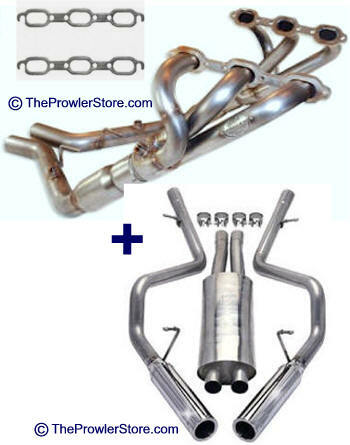 Replaces your entire Prowler stock exhaust system from the engine exhaust manifold to the tail pipe tips. Designed and engineered specifically for the Chrysler Plymouth Prowler. Includes Headers with High Flow Cats, manifold/header gaskets and clamps, Cat Back system with High Flow Muffler and high polished exhaust tips. Gives maximum performance and that race car rumble! All parts slip fit together 1999-2002 Prowlers. COMPLETE SYSTEM! - Everything you need - ready to install! Rear of car fit - exhaust tips not shown in picture. Exhaust Manifold gaskets included in this kit only. 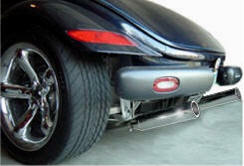 Plymouth Prowler 1999-2002 Performance Stainless Steel Exhaust System with High Flow Cat's and Muffler. Does not include Cat Back. Performance Exhaust System - includes Headers/header gaskets, High Flow Cats, High Flow Muffler you would use your original remaining exhaust pipe and factory original chrome tips. Designed and engineered specifically for the Chrysler Plymouth Prowler. 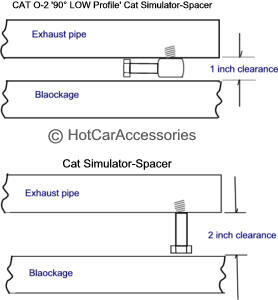 O2-SIMSX2 Plymouth Prowler 1997-2002 Performance exhaust CAT O2 Simulator-Spacer. Stainless Steel! 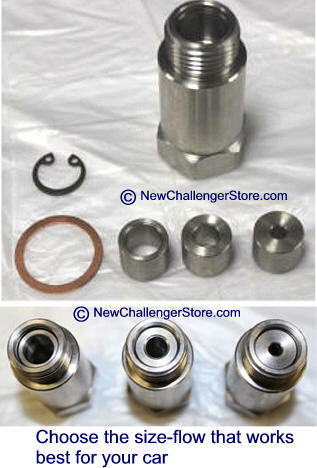 Designed off road racing use when you remove your catalytic convertors. This will stop the engine light from coming on when you have no cat's. Takes less than 10 minutes to install this small O2 Simulator. If you have modified your Prowler's system or installed performance CAT's or exhaust system you will get an engine code light on. About 99.9% time this tends to be the rear most O2 sensor at or after the CAT. With a modified or performance exhaust system the O2 sensor will receive a higher temperature and a higher flow rate than stock (unless you have tuned engine PCM). This is causing your engine controller to read that the exhaust system is out of balance throwing an engine light code. Stop your Engine Light Code. O2-SIMS-90X2 Plymouth Prowler 1997-2002 Performance exhaust CAT O-2 '90° LOW Profile' Simulator-Spacer. Stainless Steel! Designed off road racing use when you remove your catalytic convertors. This will stop the engine light from coming on when you have no cat's. Extreme Low Profile Banjo Style Right Angle Spacer, Mounts in Any Direction. Designed for narrow space exhaust pipe. The O-2 Sensor will mount at a right angel from your exhaust pipe. For tight fits around the exhaust. O2-SIMS-ADJX2 Dodge Challenger (2008-14) Performance exhaust CAT O2 Simulator-Spacer - ADJUSTABLE. Fits all models. Stainless Steel! Designed for off road racing use only. This version is adjustable. You can change heads to adjust the air flow to more tightly tune to your specific car and exhaust system. Comes with three different size air flow diameters. Try each see works best for you. If you have modified a Prowler's system or installed performance CAT's or exhaust system you will get an engine code light on. About 99.9% time this tends to be the rear most O2 sensor at or after the CAT. With a modified or performance exhaust system the O2 sensor will receive a higher temperature and a higher flow rate than stock (unless you have tuned engine PCM). This is causing your engine controller to read that the exhaust system is out of balance throwing an engine light code. NOTE 2: You must have a working O2 Sensor and bung connection. Stainless Steel!